An outstanding reference, the Handbook is designed for metering pump designers, and engineers working in all industries. 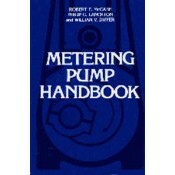 Easily accessible information includes: fundamentals of metering pump operation, principles of pump and piping system design, guidelines for selection pump construction materials, procedures for installation, operation, and maintenance of metering pumps, and general formulas, tables, charts, and pumping system layouts. Presents the basic principles of the positive displacement pump. Develops in-depth analysis of the design of reciprocating metering pumps and their piping systems. Demonstrates the practical implementation of these concepts through examples of actual pump applications. Design Principles. Operating Principles. Selection. System Design. Maintenance. Appendix. Index.